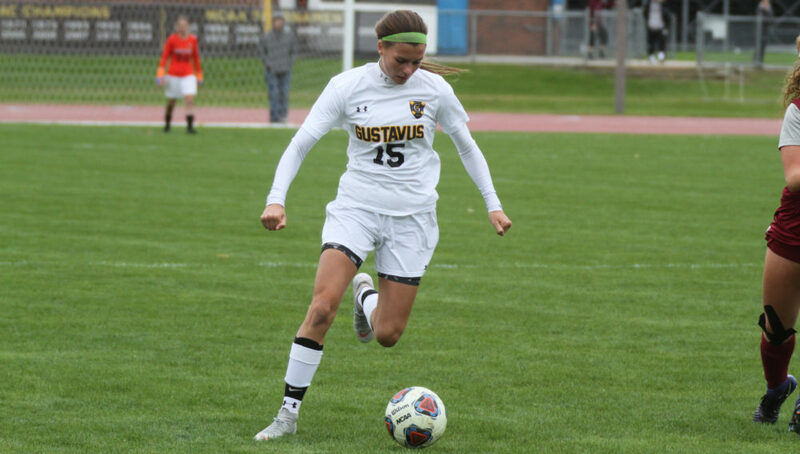 SAINT PETER, Minn. – The Gustavus women’s soccer team played host to Augsburg on Saturday afternoon and lost by a score of 2-0. With the loss the Gusties moves to 4-5-1 and 1-3-1 in the MIAC while Augsburg improves to 5-5 and 3-2 in the MIAC. The game was played even for 89 of the 90 minutes with Gustavus outshooting Augsburg 17-14, but from 11:06 to 12:06 in the first half Augsburg tacked on two goals and that was all they needed to secure the victory. The Gusties had four different players record three shots with Emily Skogseth (Sr., Burnsville, Minn.) and Katie Ashpole (So., Chaska, Minn.) each tallying two shots on goal. Abby Goodno (Fy., Little Canada, Minn.) started in goal for the Gusties and made six saves while allowing two goals. The Gusties will next be in action on Wednesday when they host UW-La Crosse for a 4 p.m. contest.